ONIKUMA is one of the biggest manufacturers of gaming equipment. We will present a model that belongs to a category of best affordable gaming headset out there. Even though it’s affordable, it offers great quality and features that can be found on much more expensive headsets on the market. Now, ONIKUMA is, simply put, a powerful example of craftsmanship which can be found at an affordable price. 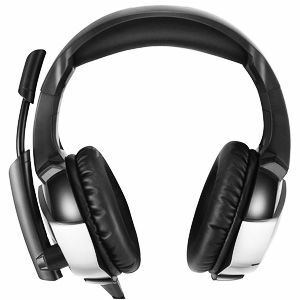 It offers great sound quality that can fit even professional gaming. What you can find in this one is a great ability to stretch and the headset that won’t wear out your neck muscles. Also, you will be able to hear powerful, flourishing sound of an explosion, gunshots and many more. What makes the quality of the sound this great is 7.1 stunning surrounding sound effect. Moreover, it has virtual speaker which is 4D displacement technology great telescopic design of a microphone. ONIKUMA offers an advantage over your enemies by providing the sound that you can hear and other players can’t- like gunshots, footsteps, or even distant reloading. Tracking this sound you will be able to easily assume your enemies position and much more. Having ONIKUMA for your teammate will make you two unstoppable tandem. It will make you dive into the world of gaming at its finest performance. However, ONIKUMA headset features 50mm driver and 16 Ohm impendence. Other than that, it offers a wide frequency range from 20 Hz- 20 KHz. Simply put, it has everything you need as a professional player or the one that wants to play the game a bit more seriously. As we mentioned, ONIKUMA offers great comfort while playing. It has memory foam ear cup with bionic protein cushion coat. This will provide maximum comfort and you will feel no neck pain that most of the headsets cause. Nevertheless, you will feel comfortable even after wearing it for a long time. Now, the comfort that you get with this price is more than just saying “worth”. However, the design of this headset will ensure that your headset stays on your head without a hint of fatigue. Therefore, if you are spending hours beside your PC, playing video games, you would not want to miss this one. Nevertheless, OKINUMA has an advanced so-called canceling microphone with an anti-static design. In other words, this gaming headset will prevent every background sound that isn’t your own voice, thanks to the cutting-edge anti-static design. Your words will be heard by your teammates clearly during the battle, and there will be no background noises. This will produce much more better communication between you and your teammates, and as you know- communication is half of the job. Now, one of the most amazing features of this one is that OKINUMA headset has ultra-strong compatibility. It can work on PSP, PS Vita, PS4, Android device, iOS device, Mac OS PC, Windows PC, Nintendo 3DS LL/3DS, Nintendo New 3DS LL/3DS, or on Nintendo Switch. Anyhow, for Xbox one, you will need an accessory to support. Simply speaking, with this headset you will be capable of playing various games. With it, you will practice your air, increase spatial awareness, you will be able to track, hear and recognize ultimate’s that were cast, and many more. 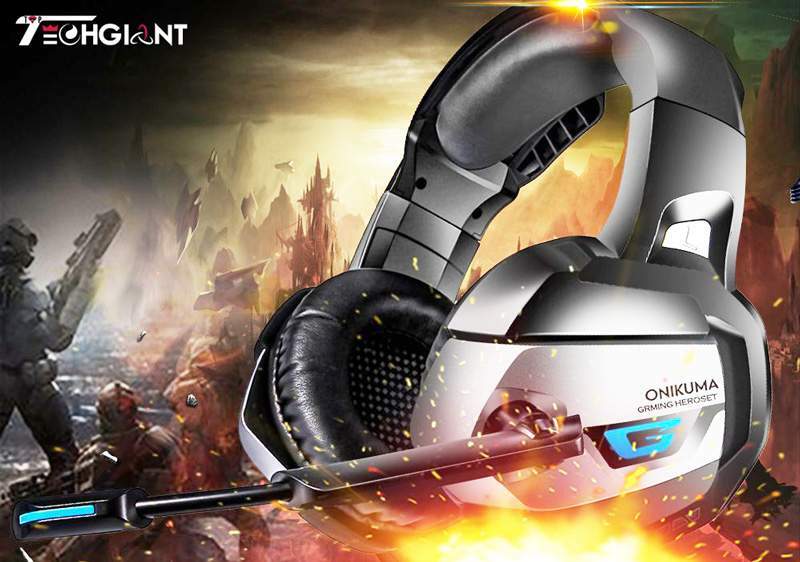 In other words, this ONIKUMA headset is your best teammate- even in 1on1 gaming. For a better sound performance, there is a 50mm constant magnetic moving bending audio gaming speaker. Once you put this headset on your head, you will dive into a world of gaming. It will provide that feeling of presence like you are really into that world of magic. Super-thin Mebrane – This technology will allow all-direction accurate and quick positioning of the speaker immersive game scene experience. Audio string is knitted – This means that the audio string is of a high quality. It has a strong PVC wire which is 5X stronger and pulling-proof. In other words, cable is highly durable and should serve you for a long time. The IC exalted driver – this driver simulates engine, hence, you will not miss its finely detailed outstanding power and craftsmanship. Given the aforementioned and the price of this product, you will get one top-notch product that pays great value for the price. Made of the finest materials, and high-quality plastic, this best affordable gaming headset should serve you for a really long time. Simply put, if we consider all the features, sound quality, performance, and durability, you will hardly find a product on the market of this price that offers similar properties. Anyhow, the only downfall of this headset might be stretchy annoying sound that comes when you touch the audio plug or rotate in the headphone jack. Other than that, the positioning of a volume wheel might be a bit tricky for you to turn it up or down- until you get used to it. In the light of everything that we previously said about this model, we may conclude that this one is definitely one of the best affordable gaming headset out there. Nevertheless, it pays excellent value for that price. ONIKUMA headset is something that every professional gamer should have. Nevertheless, if you are starting to play, and want to practice with high-quality gear, you should definitely start with this one. If you don’t like this one, you can choose from our top 11 list of gaming headsets. All in all, we hope that this review made this choice a bit easier for you.